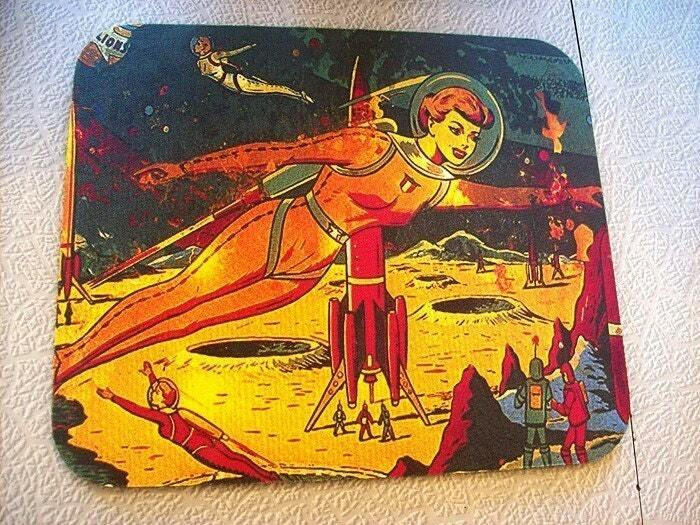 Make your work week a little more fun with this fab mouse pad featuring a retro pin up girl image who is chock full of 1950's vintage kitsch . This pad might also work as a dandy place mat, a pet bowl holder or you could just slap it on the wall! I make these babies with an industrial heat press so the colors are vibrant and they will last for click after click after click. Each pad measures 9.5" X 7.8". so be sure to visit my shop. Love the female space cadet. She is now flying around my desk top! Absolutely wonderful transaction from start to finish. Thank you! Awesome transaction! Seller communicative, shipped quickly, item as stated, and was wrapped in a beautiful hand stamped bag with a brilliant thank you note.